Minecraft 1.11.2 Mods: Installing Mods, Finally! The previous articles in this series provided the basis for setting your profiles to support Minecraft 1.11.2 mods. By using a Forge and Liteloader profile, it is now a simple matter of downloading the mod and placing it into the ‘mods’ folder found in ‘.minecraft’. I recommend you try them one at a time so you can see which could cause problems if the game ever fails to run, and to better understand what each mod alters. It is important to note that mods are mostly made for a specific version of the game. Minecraft 1.11.2 mods will probably only work with 1.11.2, but sometimes an older-version mod (1.11) will work. You can try to use an older mod, but be careful as, even if they do work, there might be glitches when accessing newer content. If you think you have added a mod and it doesn’t show up in-game, always check the version. Hopefully you already know where to find your .minecraft folder, but if you don’t, then I’m here to help. Minecraft uses this folder to store your profiles, screenshots and log files, as well as many other aspects pertaining to the game. It also contains a mods folder, which will soon contain your Minecraft 1.11.2 mods (cue the excitement). Finding the folder can be tricky, as on most Windows systems it will be in a hidden folder. The image above shows you everything you will need to know. You can see ‘%appdata%’ in the address bar at the top (type it in there and hit enter). Then, you’ll see the Romaing folder, and inside that, you’ll find the .minecraft folder in the list. Inside the mods folder you can see a 1.9.4 and 1.11.2 folder. Finally, you can see the mods I am currently using on the right hand of the screen. The full directory path is C:\Users\YourUsername\AppData\Roaming\.minecraft\mods. If your version does not have a mods folder, right-click on .minecraft and select ‘new folder’, then name it ‘mods’. Inside the mods folder, it is best to stay organized with a different folder for every version you want to maintain: 1.9.4 and 1.11.2 as examples. Installing Forge should have added these folders. You can find a list of popular, approved mods with many functions on the Approved Mods wiki page at Empire Minecraft. Popular beginner mods include Optifine, InventoryTweaks and VoxelMap. Once you have downloaded a mod, simply copy it from your downloads folder into the mods\1.11.2 folder. It’s really that easy! You did all the work with Profiles, Java, Forge and Liteloader, which is paying off now! If you haven’t yet, check out the previous articles in this series for more information. Empire Minecraft has made it easier by also providing links to the mods listed on the Approved Mods page. By following those links, you should find the main sites for mods are Planet Minecraft, Curse and MinecraftForum. There may be others, but be very wary as some are just fake sites that link back to the others or worse, can make you download a virus or other malware. Be smart with your downloads by using only trusted sources. When downloaded, the files will look like modname.jar for Forge-based mods and modname.litemod for Liteloader-based mods. Make sure you read the instructions for the mod and if there are any problems, then head to the forums and ask for assistance there. If you find a new mod that you want to use and it’s not already listed on the Approved Mods page then ask for it to be reviewed before using it on Empire Minecraft. Many servers will ban you for illegal mod-use so it’s best to ask first on all servers. Hopefully this series has given you everything you need to add mods to Minecraft. There are a number of little differences among mods and you may need more information than you can find here. Look out for reviews and explanations of some of the major mods, coming in the near future. 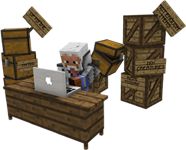 Don’t forget to join us on the Empire Minecraft forums. Here you can find discussion about everything you’ve heard about from me!